We are screening a short film, ARTISAN BAKER before MAKE HUMMUS NOT WAR on Sunday, October 13th, 7pm. Boulder filmmaker, Una Morera, directed the film. As the saying goes, “the way to a man’s heart is through his stomach” but filmmaker Trevor Graham may have discovered that the path to world peace may also be via the stomach in the documentary Make Hummus Not War. Graham is a self-confessed “hummus tragic” who obsesses over the dish. A hummus war erupted in the Middle East in 2008 between Lebanon, Israel and Palestine over ownership of the meal. Graham delves into the food fight in kitchens around the globe and finds out there may be more to the delicacy than just crushed chickpeas. 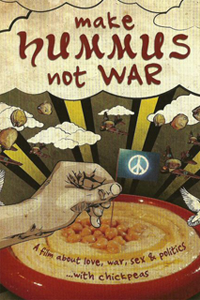 Make Hummus Not War is a mouth-watering journey through restaurants & cafes renowned for making the world’s best hummus. It’s a joy to see the passion the chefs have for the ancient craft and the love people have for the simple recipe. Generations of families have made a living off plates of hummus and there is great tradition in place with links back to biblical times. Once Graham starts to get into the politics it seems ridiculous at first but it soon becomes clear that each nation takes pride in their hummus. It’s a battle over ownership and who makes the best, but the pride also prevents the peace much like the real armed conflict in the Middle East. The situation becomes muddled further by the millions of dollars at stake in the hummus industry and the nation that will pocket the profits. Make Hummus Not War offers plenty of good food for thought.